In Arkansas, we don't have many opportunities to catch fresh lobster. We have crawfish in these parts, but their pinchers are too small for this use. I get my lobsters at the grocery store with the bands already on them. If you are lucky enough to catch a lobster or if the bands come off your store bought lobster, this tip might keep you from getting pinched. To band the pinchers, hold the lobster in one hand by the base of the claws while banding with the other hand. 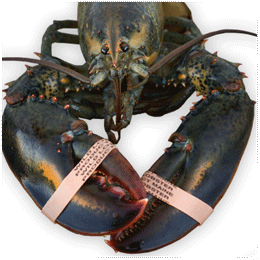 If the lobster is taken directly from cold water or from the refrigerator, it should be sufficiently calm and slow so that you shouldn't be pinched. Always remove the bands before cooking the lobster for the best meat.